Offer Details: Enjoy the complete Santa Lucia Highlands experience at the Hahn Tasting Room, where the only thing better than the view is the wine. Nestled in the heart of the Smith Vineyard, guests of the Tasting Room are encouraged to bring a picnic, relax on the deck, and enjoy their favorite Hahn wines. Tasting flights are offered daily. Hours: Tasting Room Open 7 days a week, 11am-5pm. Reservations are not required but are encouraged for groups of 6 or more. During the 1790s, Spanish missionaries recognized the rare soils and favorable climate of the Santa Lucia Highlands of Monterey and planted grapevines there. Yet nearly two hundred years later when our founder Nicolaus (Nicky) Hahn and his wife Gaby first purchased land in the Highlands, cattle, sheep and horses ranged over the hills. Vineyards were a secondary concern. Nicky immediately saw that the land he’d purchased was destined for greater things than grazing stock. He wasted no time. In 1980, the Hahns released their first wine from SLH. A mere eight years later, Nicky led the charge to establish SLH as an American Viticultural Area, a dream he saw realized in 1991. Today, Hahn Family Wines, now run by Nicky and Gaby’s son Philip, owns and sustainably farms 650 acres of estate vineyards in the Santa Lucia Highlands. SLH enjoys worldwide acclaim for the Pinot Noir and Chardonnay made there. Hahn launches Lucienne—single-vineyard Pinot Noirs from estate vineyards. Hahn open its visitor center and tasting room at its SLH winery. Hahn’s SLH vineyards replanted mostly to Pinot Noir and Chardonnay. Hahn family purchases Lone Oak Vineyard in SLH. 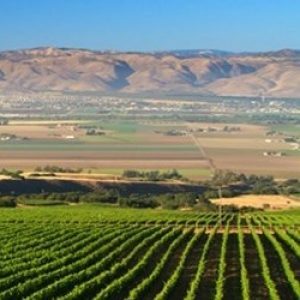 SLH designated an American Viticultural Area. Hahn family purchases Doctor’s Vineyard in SLH. Nicky Hahn releases his first vintage of wine. The Hahn family purchases the Smith and Hook vineyards in Santa Lucia Highlands. Los Padres National Forest is founded. This vast parkland includes Monterey’s Big Sur Coast along with scenic inland tracts. President Theodore Roosevelt establishes Pinnacles National Monument in the Gabilan Mountains, the range facing Santa Lucia Highlands. Mission padres tend a Salinas vineyard that has grown in size to 5,000 vines. California’s 13th mission is founded at the foot of the Santa Lucia Highlands. Spanish missionaries first planted grapevines in Monterey County as early as the 1790s. Yet nearly 200 years passed before grape-growing became a serious endeavor here. The Hahns were one of the pioneering families of that new era. Today, the second generation of the family carefully oversees four estate vineyards in the Santa Lucia Highlands and two estate vineyards in Arroyo Seco. From these magnificent properties and other vineyards, we have created three collections of wines: our Hahn, Hahn SLH and Lucienne labels.